This Qt Script example shows how to use default prototypes to make a non-QObject-based type scriptable. With QScriptEngine::setDefaultPrototype() you can specify a Qt Script object that defines a scripting interface for a C++ type; Qt Script operations on values of such types will then be delegated to your prototype object. 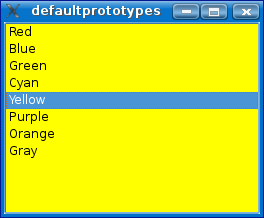 In this example, a simple scripting interface for QListWidgetItem is defined, so that the text of items can easily be accessed from script code. To define a scripting API for QListWidgetItem in terms of Qt properties and slots, we subclass QObject and QScriptable. A single property, text, is defined, along with a slot, toString. The implementation of the property accessors use the qscriptvalue_cast() function to cast the script object to a QListWidgetItem pointer. The normal C++ QListWidgetItem API is then used to implement the desired functionality. Although not shown here, it is possible to throw a script exception from a prototype function; for example, you could throw a TypeError exception if the qscriptvalue_cast() fails. QListWidgetItems are usually added to a QListWidget. While QListWidget is a QObject-based class, not all the functionality needed for this example are present. We can solve this by creating a default prototype for the QListWidget class as well. The prototype will augment the functionality already provided by the Qt Script QObject integration; i.e. if a property or slot is not found in the QListWidget object itself, the prototype will be used as a fallback. The additional slots will make it possible to add items to a QListWidget from script code, and to set the background color of the widget from a string. Again, we use qscriptvalue_cast() to cast the script object to the relevant C++ type, in this case a QListWidget pointer. The addItem() and addItems() functions simply forward their arguments to the corresponding functions in the QListWidget class. setBackgroundColor() gets the widget's palette, creates a QColor from the given string argument and changes the palette accordingly. The relevant C++ types must be made known to Qt's meta type system. For each type that we want to associate a prototype object with, we create an instance of the prototype class, pass it to QScriptEngine::newQObject(), and then create the link between the C++ type and the resulting script object by calling QScriptEngine::setDefaultPrototype(). In this example, a single QListWidget object is added as a global script variable, called listWidget. Script code can add items to this widget by calling addItem() or addItems(). Script code can connect to signals of the QListWidget object; signal handlers can use the interface defined in the QListWidgetItem prototype to manipulate item arguments. Not shown in this example is how to make QListWidgetItem constructible from Qt Script code, i.e. to be able to write "new QListWidgetItem()" in a script. In order to do this, you have to define your own script constructor for the type. The constructor would just be a factory function that constructs a new C++ QListWidgetItem and returns it back to the script. See QScriptEngine::newFunction() for more information.